and his arms got cold. and not a bit impressed. didn't you have no gun?" "He was where he belonged. He was in where he belonged." If any of you had, as an introduction to cyber space the old CompuServe program, you may remember "forums," a pale and over-policed version of Usenet. For a time I was part of a "writer's forum" that was meant to be an on-line workshop, with monthly homework assignments. One February, with everyone looking forward to March and spring weather, the assignment was to write something around the topic 'in like a lion.' This was my contribution. Wonder if an early version is still archived over at CompuServe someplace? Two elderly brothers, who weren't blood kin but had known us forever, used to come to our family reunions. In the seventies one of them told repeatedly about an encounter like the one in the poem. I doubt the old man saw the jeering grins and rolling eyes of doubters standing behind him. 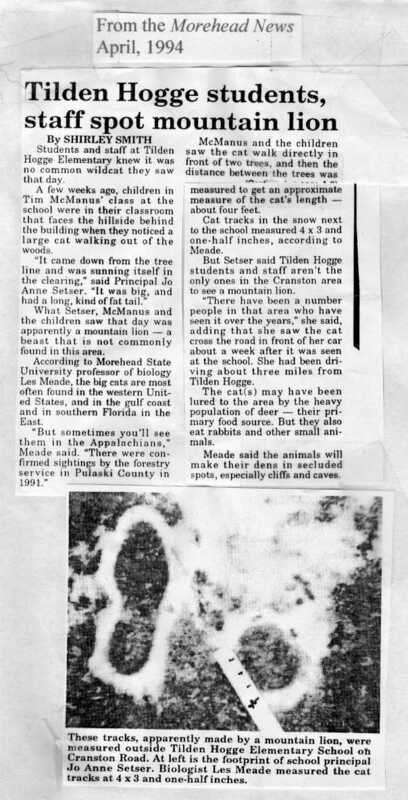 I believed him though, and it seemed likely if there was a mountain lion here in 1960 or '61, when Mr. Orcutt saw his, then almost certainly others were around. One of these "regionally extinct" creatures wandered out of the woods behind Tilden Hogge Elementary School, six or seven miles from where I'm typing these lines. On an unseasonably warm late winter day, the big cat found a piece of sunlit ground and curled up for a nap, giving the school kids and their teachers an hour or so to admire him. Then he got up, stretched, and wandered back into the Daniel Boone National Forest. I'd like to think that from where ever old Appalachian gents go when they die, Mr. Orcutt watched that lion's doze, maybe in the company of other long-dead old timers who never believed his tale.